"What is solar energy?" is the question answered on this page. For links to other solar topics, please see the main solar energy page. Solar energy is a whole lot more than most people understand it to be. 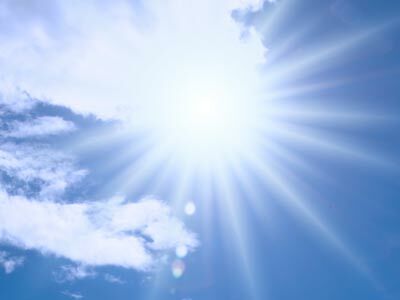 It is a common misunderstanding that solar power is limited to the energy derived directly from the suns heat and light. In actual fact the energy from the sun is responsible for almost all forms of alternate energy! Even water energy relies on the sun to evaporate water for it's redistribution as rain, which in turn keeps the rivers running! For simplicity though, we will refer to the light and heat from the sun when taking about solar energy. The Earth receives 174 petawatts (PW) of incoming solar radiation at the upper atmosphere. Approximately 30% is reflected back to space while the rest is absorbed by clouds, oceans and land masses. Defining solar energy is fairly simple, however there is not just one answer to the question: what is solar power? Generally solar energy is divided into two types: thermal (heat) energy and electric (light) energy. Below you will find a brief explanation of the two types, along with a list of the applications and technologies of each type. Thermal solar energy refers to the direct use of heat energy from the sun. Thermal solar energy is further classified as either passive and active solar power (click the links to learn the difference). Photovoltaic (PV) solar cells directly convert sunlight into electricity. The simplest cells are used to operate wristwatches and calculators, and more complicated systems are used to light houses. PV cells are combined into modules called arrays, and the number of arrays used determines the amount of electricity produced. That answers the question of "what is solar energy?" So - how does solar energy work? Click the link to find out!